On March 26th, the children at Ste. Germaine celebrated their Easter Holidays. 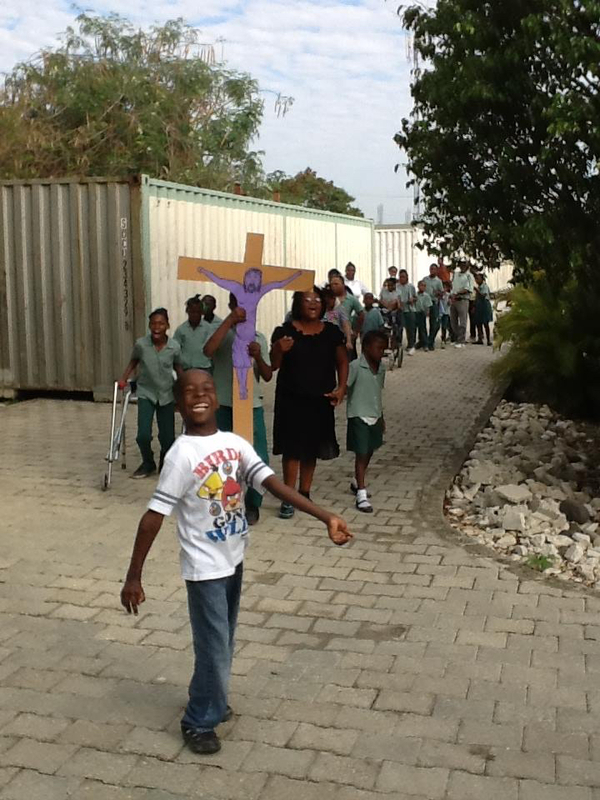 Teachers, mothers and the children had a very nice “procession” to remember the suffering of Jesus on the way to Calvary. Following the procession, they watched a movie on the Passion of Jesus. While I was watching the procession and looking at the mothers and children, I was thinking (once again!! ), that for so many of these mothers, they live their own Passion every day here in Haiti. No their kids are not crucified, but they are denied of so many basic rights and this denial often does indeed lead to their deaths. Poverty kills. Poverty crucifies–bodies and spirits. How must they feel, these mothers and fathers, when they cannot feed their kids, when they watch the little bodies rack with seizures, and they know that with medicine there would be no seizures? As Mary had to suffer while she watched them beat and crucify her innocent son, so too do these parents suffer as they watch poverty beat, humiliate and often, kill their children. The Easter story is not to be considered as an old story from years ago. Every day innocent people live out their own crucifixions. God raised Jesus from the dead. We try very hard to rise beyond the limits facing us and to bring life and education to those we serve. While we struggle with all we cannot do, we rejoice in all that we have been able to achieve thanks to the help of so many people. Our smiling children show us we are on the right path doing the right thing. Our smiling children give us a glimpse of the hope of the Easter Sunday Resurrection.